Escape to the sugar white sands of Gulf Shores, Alabama! Don't walk to the beach, stay on it and enjoy the sound of the surf and the spectacular view of the ocean from the private decks on the main level or upper level. Home is away from the hustle & bustle of high-rises, located in a quiet area on the beach. The location is great for family activities. Pets are only allowed with prior approval and we do Not allow Smoking. Please visit Fun Spot on Facebook for direct contact. This home has three master suites with Gulf-front sun decks plus two other bedrooms, 5 bathrooms, 9' ceilings, ceramic tile flooring, wood flooring, ceiling fans, and den area/playroom upstairs for the kids. Crown molding in every room, granite counter tops in the kitchen, cultured counter tops in the bathrooms, and much more. This fully-equipped, Non-Smoking house has all of the conveniences of home. It is conveniently located approximately 3 miles from downtown Gulf Shores just across the bridge to Little Lagoon on highly desirable West Beach. The house is located on the absolute best beach area on West Beach. Gulf Shores small town atmosphere makes your visit to the beach comfortable and easy. Spend the afternoon browsing boutiques, gift shops and galleries, or hunt for name-brand bargains at local outlet stores. The Riviera Center, one of the South's largest factory outlet malls is only a few miles away in Foley, Alabama. Especially for the kids and young adults, Gulf Shores now has the newest amusement park on the Gulf Coast since Six Flags in New Orleans was destroyed by Hurricane Katrina in 2005. Gulf Shores is Alabama's best-kept secret and brightest jewel. The beaches are magnificent, sparkling white sand and there is never a shortage of fun, sun and surf on the beautiful Gulf of Mexico. The easy, breezy, carefree atmosphere and subtropical climate makes it a year round destination for your family vacation or a romantic get away. Since we are on the Gulf of Mexico we are blessed with an abundance of fresh seafood. Last night's or this morning catch will be your dinner. Treat your palate to the unlimited array of exquisite, mouth-watering seafood dishes at anyone of the many fine restaurants on the island. If you are hungry for something other than seafood you can tickle your taste buds with Cajun Creole, Barbecue, Italian, Oriental and good old down home cooking. You can feel assured that you will find the perfect ambiance and food to suit your fancy. Listen to the sound of the surf as you go to sleep. 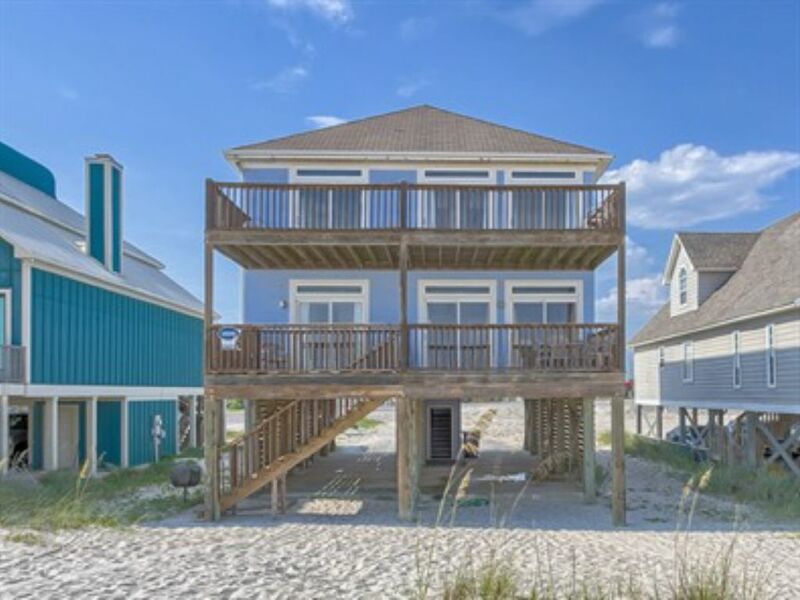 Unwind and release the tension as you hear the waves roll over the sand inviting you to dream about the coastal paradise and magical beauty of Gulf Shores. Tee it up at one of the 10 challenging golf courses with-in a 30-minute drive from where you are staying. My wife and I have two children, a daughter (29) and a son (26). We live in Tuscaloosa, AL and all graduated form that school located there that some people love and some people hate (ROLL TIDE!). My wife is in the medical profession, I am retired military and retired public works director. Our son and daughter are both still in school in the medical profession. We love the outdoors and were blessed to be able to acquire this property. We loved the location. It has a very large beach area and is located next to the Little Lagoon Bridge. Good fishing area and great place for the kids and entertainment. We like the fact that the adults can be downstairs in the family room and there is a separate family room upstairs for the kids. Thank you so much for helping us to create memories to last a lifetime!!! Everything we expected and more. The owner was very responsive to any requests! It was great having you, Patricia. Hope you will visit again. 2018 marked our 10th Thanksgiving Holiday beach celebration, and we found the perfect spot at the Gulf Front Beach House! All 11 in our party (9 adults/2 children) enjoyed their "private space," as well as the common areas to gather and watch football. The beach was literally steps from the back deck, making it easily accessible. What more can I say … it was just nice all the way around. I took my children and grandchildren for a whole week to this lovely home!! We had an beautiful vacation in Gulf Shores!! Our host was attentive and took great care of us. I would highly recommend this property to anyone looking for a family gathering!! Great location. Nice house for a big family reunion. Great to have a bathroom in all the bedrooms. View from balconies was beautiful. Perfect location and floor plan for family fun! We gathered our 3 married children and 4 grandchildren here to celebrate our 40th wedding anniversary. This house met all of our needs like a charm. The kids loved the play room upstairs and the downstairs common areas had plenty of space for all. The 4 married couples each had their own full bath, plus the kids had one of their own. We enjoyed the balconies right on the gulf, morning noon and night, viewing sunrises and sunsets on the gulf waterfront. All of the appliances and flat screen TVs, etc. functioned excellently. The owners are responsible, responsive, and very easy to work with. A time in this house is a time to cherish always. Golf: The island offers you a diverse array of quaint gift shops, boutiques and souvenir shops. Or you can travel a few minutes up highway 59 to the City of Foley where you will find 130 name brand factory stores like West Point Stevens, The Gap, Polo, Nike, Liz Claiborne and you will find them all-at the Riveria Centre Factory Outlet Mall-Plan to spend the day and shop-till-you-drop. You and the family can visit Fort Morgan, Bon Secour Wildlife Refuge, Gulf State Park and many other natural assets that make this area unique. The area provides a lot of attractions like para sailing, jet-ski rental, water slides and go carts at Waterville, or bungee jumping at the Track. The Alabama Gulf Coast also offers you the best deep-sea fishing you will find any-where. There are many charter boats to choose from. So go ahead and feel the sand between your toes. Sunbathe, shop, go deep-sea fishing, play a round of golf, have an exquisite dinner then watch the most beautiful sunsets you will ever see and take home all of the wonderful memories of the Alabama Gulf Coast.